AFRISO has been manufacturing complex plastic manifolds for leading global vendors of floor heating, cooling and geothermal systems for many years. The know-how, together with our exceptionally high degree of vertical integration including our own tool design allows us to implement even complex geometries to customer specifications. High-grade plastic materials enable a great variety of technical features and optimum, practical designs. Plastic valves are not susceptible to corrosion and deposits. Thermometers and flow meters are easy to integrate. Our offering is complemented by a comprehensive range of accessories. For decades, experts from the fields of heating, ventilation and air conditioning have been working with AFRISO products under the brands of leading system providers. Can be combined with thermometers, flow meters, thermoactuators, connection valves and many other components. Modular, very short, robust plastic heating circuit or cooling circuit manifold with up to 12 heating circuits. Return with stroke valves for actuators, flow with shut-off valves or flow meters as required. Temperature indication at flow and return lines. Main connection with union nut G1. Manual vent, filling and drain valve or quick air vent can be mounted. With dovetail guide at both ends for fast mounting to wall mounting bracket and for maximum installation flexibility. 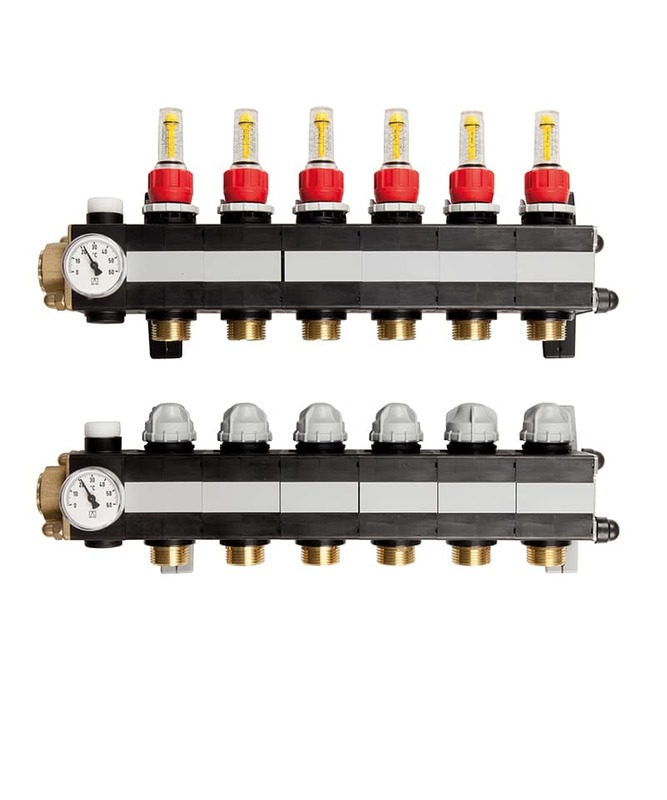 Modular, very short plastic heating circuit or cooling circuit manifold with up to 12 heating circuits. Return with stroke valves for actuators, flow with shut-off valves or flow meters as required. Temperature indication at flow and return lines. Main connection with union nut G1. Manual vent, filling and drain valve or quick air vent can be mounted. Flexible connection from left or right as well as from the bottom with a bracket kit. 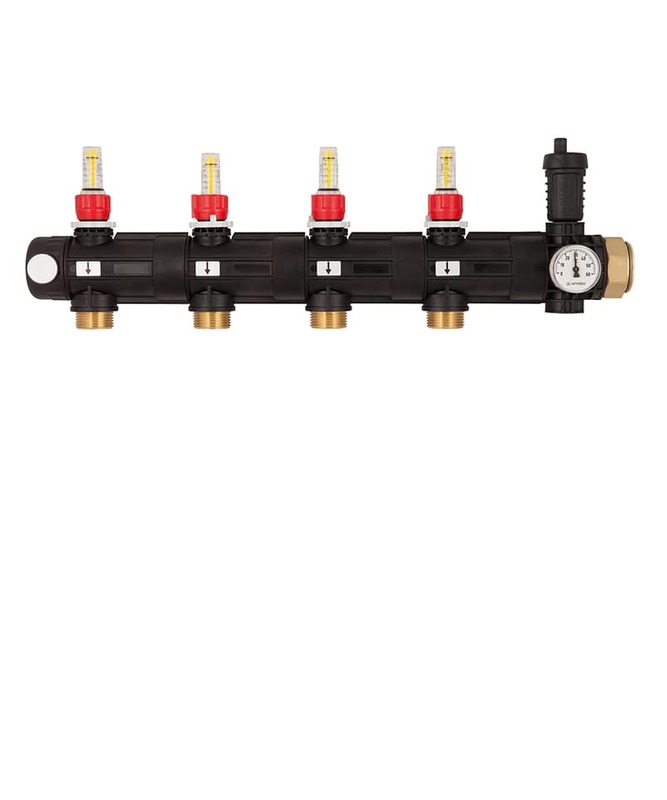 Stainless steel heating circuit manifold with up to 12 heating circuit manifolds. 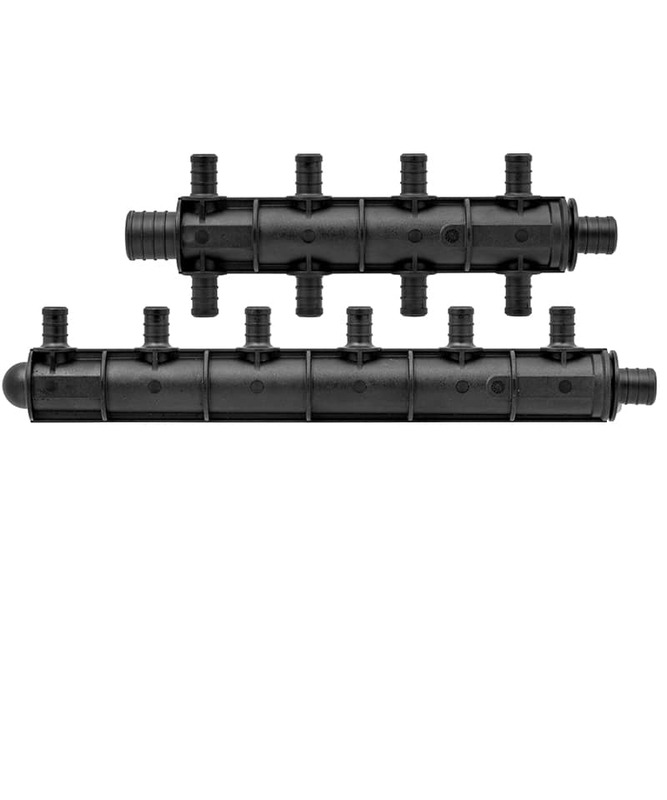 Return with stroke valves for actuators, flow with shut-off valves or flow meters as required. Main connection with union nut G1. With filling and drain valve as well as manual vent. Quick air vent can be fitted. Connection via angular connection piece with ball valve G1 or control valve (return: actuator adaptation M30 x 1.5 male thread/flow: adjustment valve or flow meter). Easy snap-on mounting of manifold on wall bracket. 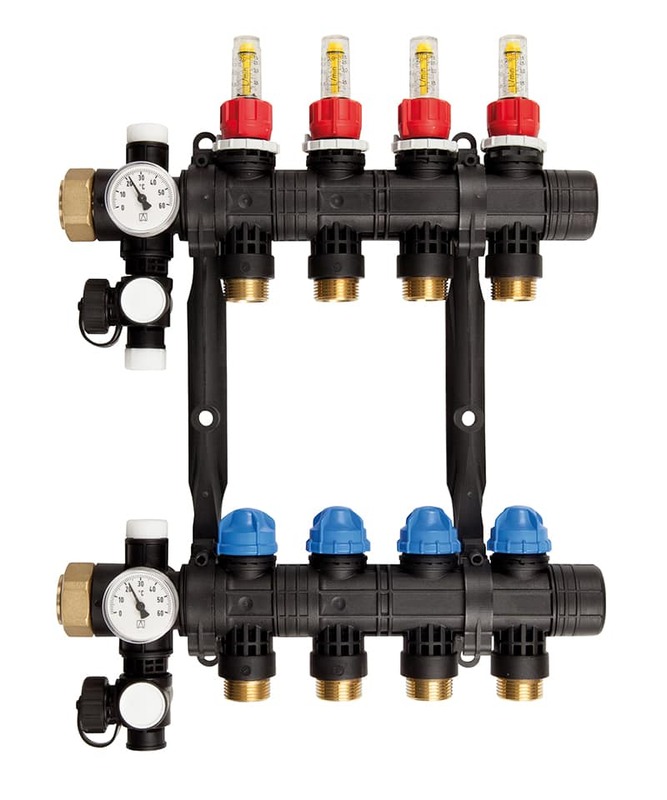 Modular plastic manifold for industrial or geothermal applications with up to 20 heating circuits. Return either with stroke valves for actuators or with shut-off valves, flow either with shut-off valves or with flow meters as required. Main connection with union nut G1½. 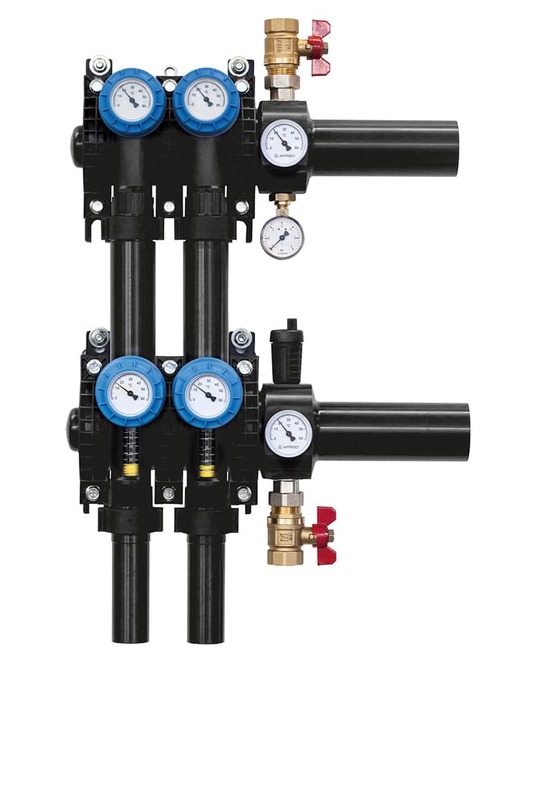 Individual installation of filling and drain valve, quick air vent, pressure gauge and thermometer via multi-way union. Easy snap-on mounting of manifold on wall bracket. 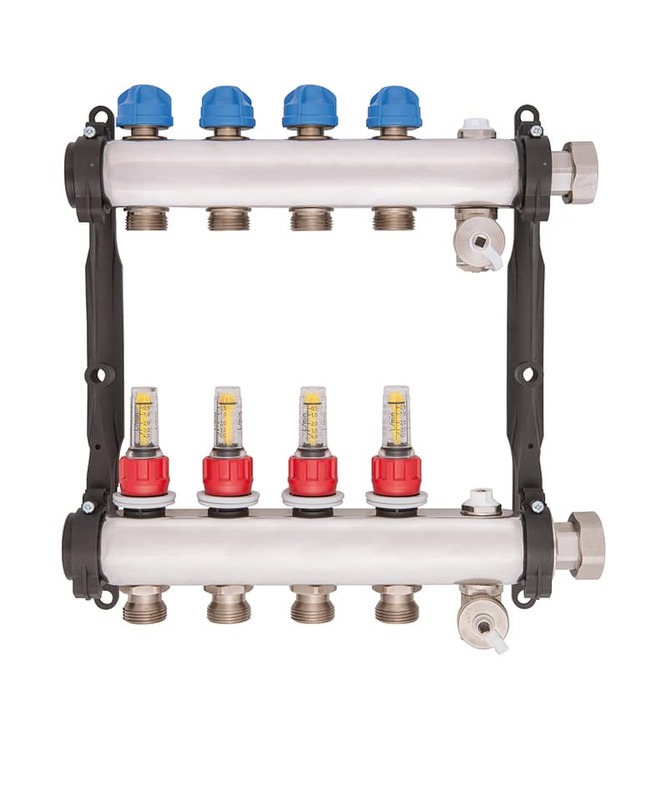 Modular manifold for brine, made of plastic, for any number of heating circuits. With one shut-off valve each in the flow and return (adjusted values can be locked via a ring) and integrated flow rate indication in the return. Main circuit connection and heating circuit connections can be made to customer specifications. Individual installation of filling and drain valve, air vent and pressure gauge via cross piece. Thermometer can be integrated in the line and/or in each individual heating circuit. Robust, easy-to-mount wall bracket. Plastic drinking water manifold with 3, 4, 6 or 8 drinking water connections. Triple and quadruple versions also available in H shape (both ends). Another manifold can be connected to the outlet end.